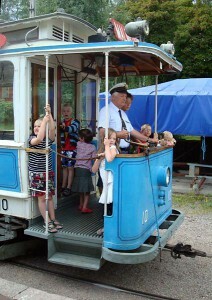 The Swedish Tramway Society operates museum tram service at four locations in Sweden. The tram can take you to Östersjön, the beautiful tram stop in the middle of lovely Södermanland. At the Malmköping Museum Tramway, Sweden’s urban transport history is embodied in trams and buses from many cities and periods. The tram can take you from Norrmalmstorg to the natural beauty of Djurgården. There you will find Vasamuseet (the Vasa Museum), the Nordic Museum, Junibacken, Skansen, the Gröna Lund amusement park, the Hasselbacken restaurant, and the beautifully situated Waldemarsudde and Rosendal. The tram can also run through a beautiful park setting in central Malmö, from Banérskajen via Malmöhusvägen and Kung Oscars väg to Stadsbiblioteket (the City Library). No matter which car you choose, you’ll be in good company.